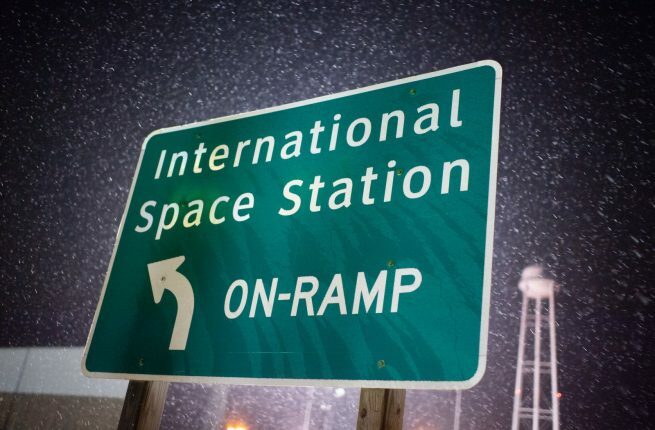 WALLOPS ISLAND, Va. — NASA and Northrop Grumman are preparing to launch the next Cygnus spacecraft, S.S. John Young, on a mission to carry supplies, experiments and equipment to the International Space Station (ISS). UPDATE 11/14: The launch of the NG-10 Cygnus spacecraft was postponed from its initial Nov. 15, 2018, by 24 hours because of inclement weather. The mission is now scheduled to get underway no earlier than 4:23 a.m. EST (9:23 GMT) Nov. 16 from the Mid-Atlantic Regional Spaceport’s Pad 0A at NASA’s Wallops Flight Facility in Virginia. The probability of weather violation for the Nov. 15 attempt was expected to be 90 percent. That reduces to 55 percent for the new Friday morning attempt. Should the mission be postponed to Saturday, that percentage drops to less than 5 percent, according to NASA. The mission’s “NG” designation stands for Northrop Grumman, which acquired Orbital ATK on June 16, 2018. 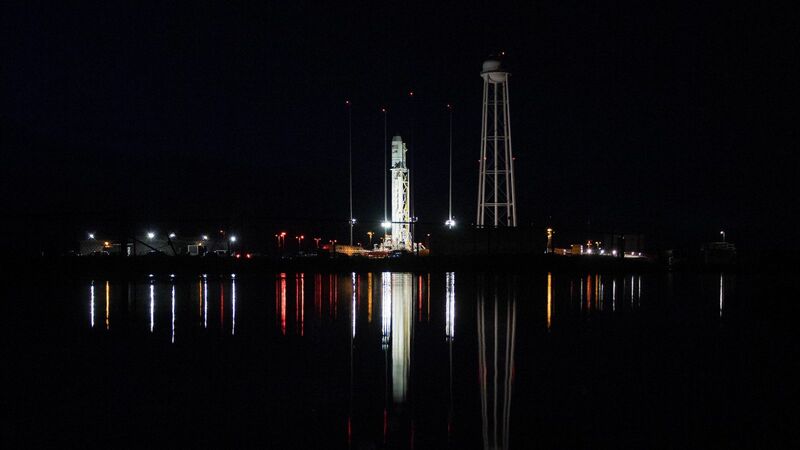 Northrop Grumman now operates the Cygnus spacecraft and the Antares 230 vehicles, which will carry out the NG-10 mission and the company’s one remaining Commercial Resupply Services (CRS) mission, NG-11. After the NG-11 mission, currently scheduled to take flight in spring 2019, the company will progress on to the second contract, CRS2. Northrop Grumman has signed up to conduct at least six Cygnus missions under CRS2. This will be the ninth flight overall for an Antares rocket and the fourth of the enhanced Antares 230 variant. The Antares main booster was upgraded in 2016 from the previous AJ-26 engines to two NPO Energomash RD-181 first stage engines. The Ukrainian-built engines burn a mixture of liquid oxygen and rocket grade kerosene, which deliver an estimated 864,000 pounds (3,844 kilonewtons) of thrust at liftoff. The upper stage Castor 30XL solid rocket motor completes the payload’s delivery into orbit. The S.S. John Young Cygnus represents the seventh flight of the greater-cargo-capacity enhanced Cygnus spacecraft. It consists of a Pressurized Cargo Module that is loaded with the food, water, equipment, supplies and experiments for each mission to the ISS. The Service Module provides the power, propulsion and communications for the spacecraft. A single engine allows the spacecraft to change orbits, while two fixed-wing UltraFlex solar arrays of gallium arsenide cells generate 3.5 kilowatts of power. Once in orbit, the S.S. John Young is scheduled to make its way to the ISS. The trip is expected to take several days. Once, there, it will position itself about 33 feet (10 meters) below the station’s Destiny module. European Space Agency (ESA) astronaut Alexander Gerst will then use the 57.7-foot (17.6-meter) Canadarm2 to grab the spacecraft and maneuver it to the Earth-facing port of the Unity module, where it will be berthed and secured to the station. The spacecraft is scheduled to remain attached to the ISS until February of 2019. If Cygnus launches Nov. 16, the spacecraft is expected to berth with the outpost Sunday, Nov. 18. About 19 hours after that, Progress MS-10—which is currently is slated to launch at 1:14 p.m. EST (18:14 GMT) Nov. 16—should arrive and dock with the Zvezda module. The S.S. John Young will be carrying some 7,600 pounds (3,450 kilograms) of experiments, supplies and equipment to the ISS and Expedition 57 crew members, which currently consists of Gerst, Russian cosmonaut Sergey Prokopyev, and NASA astronaut Serena Aunon-Chancellor. 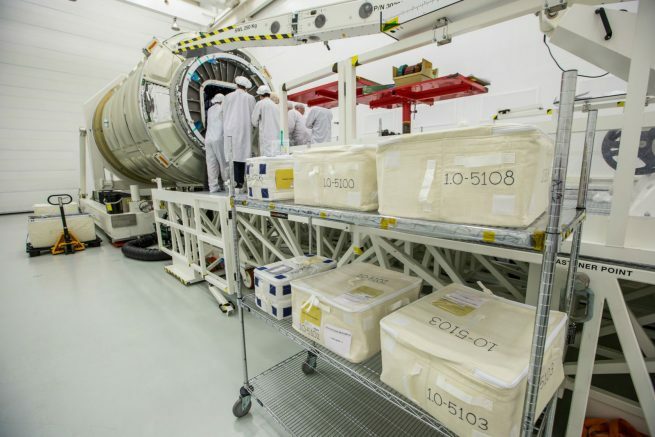 The cargo manifest for the NG-10 mission has undergone some modifications in light of the recent Soyuz MS-10 in-flight abort. The Oct. 11, 2018, launch from Baikonur Cosmodrome experienced a booster separation failure, which triggered the vehicle’s emergency abort system, sending Russian cosmonaut Aleksey Ovchinin and NASA astronaut Nick Hague on a harrowing ballistic re-entry. The two men landed safely downrange and were recovered, but the failure left the space station short two crew members who were trained to conduct a number of specific experiments while at the outpost. The next scheduled Soyuz launch has been moved up from Dec. 20 to Dec. 3, when Russian cosmonaut Oleg Kononenko, Canadian Space Agency astronaut David Saint-Jaques, and NASA astronaut Anne McClain are slate to launch from Baikonur. Once the final manifested cargo was loaded into the spacecraft, Cygnus was encapsulated inside the payload fairing of the Antares rocket. Then on Nov. 13, the rocket was moved to the launch pad and raised vertical in preparation for launch. The mission’s manifest includes a number of scientific payloads designed to conduct investigations that could possibly benefit life on Earth as well as missions beyond our home world. These experiments include an investigation called CEMSICA, which will test a process of using particles of calcium-silicate to synthesize membranes as thin as a human hair. These membranes can separate carbon dioxide molecules from waste gases—a technology that could enhance our ability to reduce our planet’s greenhouse gases. An investigation called CASIS PCG-16 is designed to evaluate the growth of protein crystals implicated in Parkinson’s disease. Crystals grown in microgravity are larger, enabling researchers to make a more detailed analysis of the protein’s exact shape and morphology, and aid in better understanding the disease’s pathology. NG-10 will be carrying to the station a machine called the Refabricator—an integrated 3D printer and recycler. The machine, produced by Tethers Unlimited of Bothell, Washington, is designed to recycle waste plastic materials into high-quality 3D printer filament. The technology, if tested successfully in space, could enable sustainable fabrication, repair, and recycling on long-duration space missions. It would also eliminate the need for carrying a large supply of feedstock material for the printer. A virtual reality display called VECTION will also be aboard NG-10. ISS crew members will be able to use the display, sponsored by the Canadian Space Agency, to examine how astronauts’ sensory input is affected by microgravity, specifically looking at how it may cause a person to make errors in estimation of velocity, distance or orientation in relation to their physical surroundings. The MVP-Cell 05 experiment uses a special centrifuge to produce a variable gravity environment to study the process of cement solidification in various extraterrestrial gravity conditions. It is part of an ongoing investigation into the process of how to use cement to build future structures on the Moon, Mars and other extraterrestrial bodies. In addition to these and other experimental hardware packages, the S.S. John Young will be taking a number of CubeSats to the ISS. These will be taken aboard the station and loaded into NanoRacks CubeSat deployers positioned above and below the station for later deployment. At the end of its stay at the ISS, the station crew will load the spacecraft with cargo for disposal and the vehicle will be unberthed from the outpost via using Canadarm2. It will then boost itself to a higher orbit where it will deploy the NSLSat 1 CubeSat. NSLSat 1 is a 2U CubeSat mission designed to correlate solar activity to electron density in the Near-Earth plasma field. It is expected to be placed in a near-circular 310-mile (500-kilometer) orbit. Following this deployment the S.S. John Young will be deorbited and perform a destructive re-entry over the Pacific Ocean. Northrop Grumman named the spacecraft after NASA astronaut John Young, NASA’s longest-serving astronaut and a veteran of Gemini, Apollo, and Space Shuttle missions. Young died Jan. 5, 2018, at the age of 87. His last flight was as commander of STS-9 in 1983. Young retired from the space agency in 2004 after serving for 42 years in a myriad of capacities that enhanced the training, safety and effectiveness of NASA’s human spaceflight efforts.